Not a complicated recipe here, but always a good one to know. 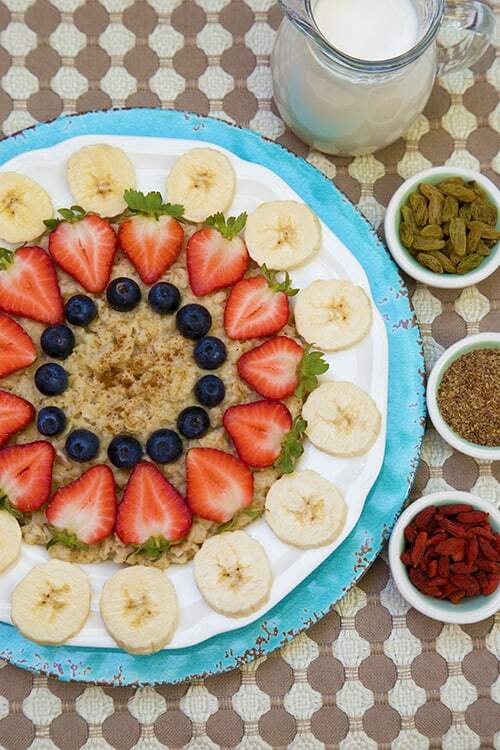 Oatmeal and berries is one of the best, heart healthy ways to start your day! Not only is it satiating, but it help lower cholesterol, and with the addition of berries it is high in antioxidants. For simple morning oatmeal, this is the way I always make mine. I use Old Fashioned Oats, Banana, Blueberries, Strawberries, Raisins, Ground Flaxseed, Almond Milk, and Goji Berries (sometimes). Try this yourself at home! Cook oats in water according to their package directions. Once cooked, stir in milk. Add all topping ingredients and serve warm!